A US family are facing a barrage of criticism after they surrendered their dog to a shelter because she disrupted their baby’s sleep. 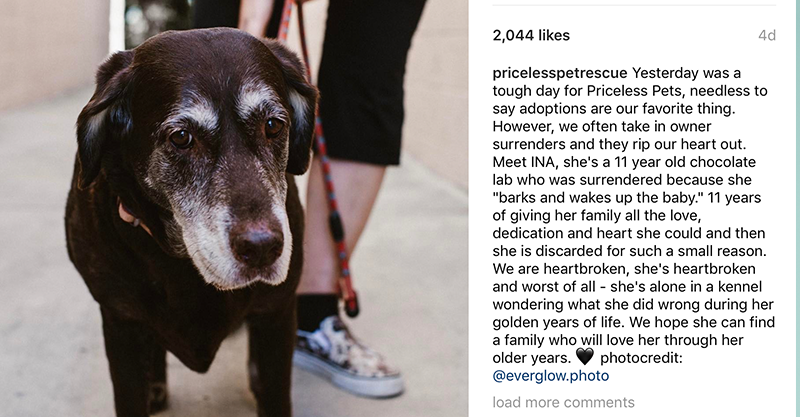 South California-based Priceless Pets posted an image of the 11-year-old chocolate Labrador to Instagram with a backstory about why her family had given her up. The rescue staff were as heartbroken as this downcast dog, feeling the family in question offered a “small reason” to part with a beloved pet. “Eleven years of giving her family all the love, dedication and heart she could and then she is discarded for such a small reason. We are heartbroken, she’s heartbroken and worst of all – she’s alone in a kennel wondering what she did wrong during her golden years of life. We hope she can find a family who will love her through her older years,” Priceless Pets wrote in the caption of Ina’s photo. “What a beautiful dogo! Humans make me so angry sometimes,” one follower wrote. “That’s literally the worst. How. How in any way could you give up a pet you’ve had that long. My dog died when she was 14. I’d kill to have her back. People are selfish,” another posted. “These people make me sick. I hate them. Who would do this to the poor baby?” a commenter asked. “I know it’s upsetting for the dog to leave it’s family, but getting rid of the dog probably wasn’t the family’s first choice. If I had a dog for 11 years, getting rid of it would break my heart. But at some point, it gets too difficult to keep it. If you’ve ever lived with a barking dog and a baby, it’s difficult. It’s sad that the dog had to leave, but please don’t bash these parents. Try to understand and put yourself in their place,” one concerned follower pleaded. It’s plausible that desperate, sleepless parents at their wits’ end might find themselves making very tough calls in the name of their own sanity. We’re wondering if this happens more than we realise as mums and dads struggle with the duelling demands of pets and babies – and whether the parents were in a position to seek out professional advice before giving up their pup. The good news is that this story has a fairly happy ending. The Priceless Pets Instagram comment thread led us to dog-lover Roofus and Kilo’s Instagram – and this little story (above) about where the lovely old doggie has ended up. It looks like – despite her unfortunate rejection – she’s now going to be loved and cared for in her twilight years, thanks to a lovely woman who’s given her a home. Ina will have another older dog as a companion, constant adult company and nice walks on the beach to help soothe her broken heart. What a complex dilemma this could be, for many overwhelmed families. Have you had issues settling a baby in with a pet? What would YOU do in this situation?